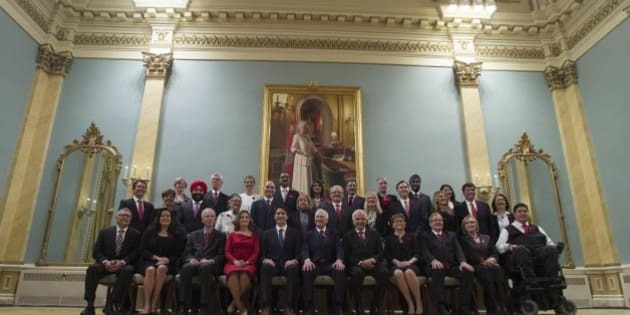 I don't know about you, but I have been astonished at the many media pundits who question Justin Trudeau's decision to appoint a cabinet with gender parity. The CBC panel on Nov. 1 with The Walrus editor Jonathan Kay was a real low point. Suddenly a hue and cry is raised that having 50 per cent women will entail incompetent appointments. Kay even kidded that it was unfair to his "people." It reminded me of the Parks and Recreation episode where men rallied for their rights crying out "we have not been treated fairly — really recently." I do not recall anyone questioning the merits of male ministers being appointed as the vast majority of cabinets — forever. Were all those stellar choices under Stephen Harper (Julian Fantino, Vic Toews, and Pierre Poilievre to name a few) just so unquestionably well-prepared for the job that the matter never came up? Or is it beyond obvious that questions of merit never surfaced when the expected men were put in their usual spots — known as positions of power? My enthusiasm largely stems from knowing how much a gender-balanced cabinet changed — for decades — the political role of women in Norway. The first woman prime minister of Norway, Gro Harlem Bruntdland, may be best known to Island Tides readers for her chairing of the World Commission on Environment and Development. The landmark report "Our Common Future" is often just known as the "Brundtland report." It was in that period that I had the great honour of working with her. She also made dramatic changes to Norwegian society when she appointed 40 per cent women to her government in 1986. It was not an easy move to make. One of my friends who worked most closely with Gro Brundtland said she had to consciously sacrifice a generation of strong male leaders to take a meaningful step for women's rights. "Women in positions of power change a society." Today in Norway, the government still reflects gender parity. And the move to equal rights did not stop there. Norwegian women are by law 40 per cent of corporate board rooms both in government-run enterprises and in the private sector. Women in positions of power change a society. Gender roles and expectations shift in profound ways. One of my favourite anecdotes demonstrating this reality also relates to Prime Minister Brundtland. When she stepped down after many years in office, a Norwegian friend's little girl was watching the news about the leadership contest to replace Brundtland. Several men and women were running for the post. Her daughter was startled and asked her mother, "You mean, a man could actually be a prime minister?"